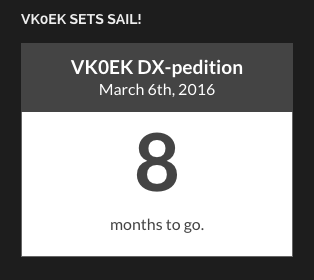 We are now 8 months away until the VK0EK Team sets sail. We are $60,000 away from our funding goal and thank all who have donated so far, and if you haven’t already donated – please consider a donation. Your donation at any level will put you on the “Express QSL” list – meaning you will be in the first LOTW Upload as well as be the first to receive your printed QSL card. VK0EK – Brought to You, by You! ← VK0EK Angel Matching Fund Will Work at Friedrichshafen!